I recently ran across the need to expand fields that automatically sync from Dynamics AX 2012 R2 to Outlook contact records. It is a very time consuming and labor intense process to manually map fields on each Contact record selected for Outlook Synchronization. 1. Business Fax is not a field synchronized from AX to Outlook through standard out-of-the-box mapping. 2. 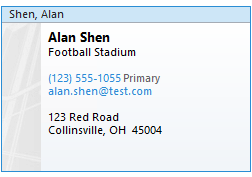 By default, the Outlook Contact card displays the Primary Number selected in AX but the Business Telephone Number field is not populated on the Outlook contact form. 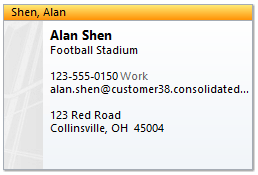 I want the Primary Telephone to show both on the Outlook Contact card and form as the Business Telephone Number. The automatic field mapping can be customized by modifying the createFieldMapping method under the smmContactPersonSynchronizationFieldMapping table. Of course, this may not meet your specific needs but it provides an example of what is possible through a little customization.